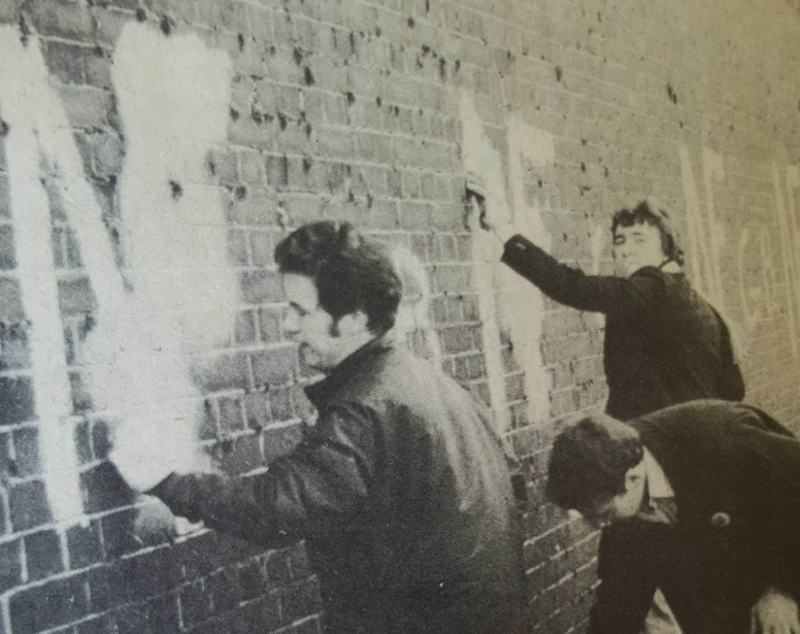 A photo of Anti Nazi League activist Geoff Brown - one of the driving forces behind the Northern Carnival 1978 - scrubbing our racist graffiti. The idea of the Northern Carnival against the Nazis was born on 30 April 78, as 80,000 made their way home from the London Carnival Against the Nazis - 2,500 of them on fifty coaches and minibuses from Greater Manchester. 1. The decision made at the weekly editorial meeting on Tuesday 11 July 78 in the Manchester Evening New office not to cover the carnival. This could be because of the MEN having a close relationship with Greater Manchester Police and its reactionary chief constable, James Anderton. In the event the vast majority of those attending were young and probably not MEN readers and came because friends, school, college and workmates, pub buddies, fellow trade unionists, etc, told them about it. The coverage from Granada Reports was also very good, not least thanks to the entire Granada Reports team signing up to the Anti Nazi League. 2. The hiccup which came when the director of Manchester Parks Department briefly withdrew permission for us to use Alexandra Park because he thought we had breached an agreement that there should only be one concert. His attention had been drawn to a poster for a 'concert' by Graham Parker and the Rumours on the Thursday, 13 July. He took some persuading that this was only a rehearsal as it indeed was. Parker was supporting Dylan at Blackbushe Aerodrome on the Saturday and wanted to practise an open air gig, he'd never done one before. The director watched several thousand of us sitting on the grass in the park listening to the rehearsal with the actor-writer Ernie Dalton, who compered the carnival, saying repeatedly 'This is just a rehearsal' and all was fine. Some cynics suggest that fear of those who might turn up on the Saturday to find the concert cancelled and seek to take it out on those responsible for the cancellation also played a part in his decision. There was of course a great deal of preparation. People were making special banners, placards and badges and if need be booking coaches, selling tickets. At the Manchester Poly Students Union volunteers were working on thousand of sticks made from sawn up ply wood to be to be stapled to yellow ANL cardboard discs to make the lollipops by which the ANL was known. A deal had to be cut to avoid any hassle over fly-posting with Tosh Ryan, Manchester's fly-posting king. Tosh saw it was a good idea to avoid a flyposting war and to offer to fly-post for the carnival. There weren't as many posters as we wanted as the fascists had firebombed the office in London. Flat back wagons had to be begged and borrowed and diesel generators hired to put on the back of them to power the amps for the half dozen or so bands that played from Strangeways to Alex Park. There was a lot of work approaching trade unions and sympathetic businesses for funds, making donations and buying space in the brochure we produced for the carnival. People had to get up at six in the morning on the 15th to get to Strangeways and persuade people that this wasn't a good day to park there. The day itself went according to plan. The police had nothing to do. The aftermath was a long and sometimes difficult one as with the police killing of Blair Peach at the demonstration against the fascists in Southall just before the May 1979 general election. The carnivals gave us the confidence that we could win and we kept on till we defeated the NF Later in the 1990s we had to do the same with the BNP and more recently with the EDL. Now it's the Football Lads Alliance and the former EDL leader Tommy Robinson, now released from jail, we need to fight.